MY VERDICT: Rebecca Minkoff's eatable collection! Well not quite eatable but it sure does look the part. It hits the A/W print trend right on the head reassuring us that we will be able to carry our favourite investment pieces straight through to the summer, if not even longer but that's something only time will tell, and could things get better than these newsflash? They could! If only these news came in hues of pastel mints, beige and nudes (Oh, wait! They do!) and perhaps also bright orange and blues luxuriously popping against a white base for true celebration of the season (Oh my, I can't take it... if only, oh yes!) And would skilfully fusing these colours together through gradient fading a la ombre, that we know so well, be pushing it? 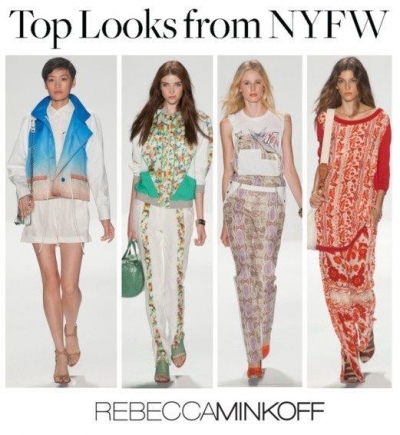 It so would be, and Rebecca Minkoff has pushed it right for us. It's genius and great at its best with every single piece a wardrobe staple on its own - and easy to match for any time of day - there is but one downside to the collection and that's massive one; It's not available until Spring 13. Oh how our greed is overcoming us! What's your verdict on the collection, do you love/hate it and why? Please do share your opinions, all is welcome and check back soon for the next part in NEW YORK FASHION WEEK: A Collection A Day! These brown Christian Dior loafers just arrived at BuyMYheels.com. With the detailing that just breathes ‘perfection’ and at £140, only a gulp of the original £250, it’s a matter of who strikes the fastest. I rarely do decide to write about one specific product that we get in unless it has really caught my fancy, so I’m sure you can tell that these soles have struck me down completely. In the most loving of ways. With Fashion Week buzzing all over the globe, everyone is generally taken by the glorious industry that is ‘fashion’. I have of course got the updates of my favourite new catwalk collections on our Facebook Page, so make sure you ‘Like’ for the most recent updates. There will be absolutely no missing out, I promise. As for these loafers, I dug deep down into my collection of inspiration files as soon as I set sight on them and just knew I’d seen something, just something, that for Autumn 2012 would challenge my inner fashionista like there is no tomorrow. As you can tell from the top 3 images, this is what’s made me jump up-and-down, running circles around my desk. The ‘Boyish’ trend that stylishly entered the pages in our #Glossies (That’s the Fashion Week Lingo for ‘Fashion Magazines’) this autumn. This trend is a far cry from my daily fashion-self. Which is exactly why it’s in my style-files of inspiration, I’ve got piles and masses of them but more about that another time. Another trend that’s similar and touch on the subject is the woman’s essential ‘power dressing’. These two trends are easily distinguished but should not during any circumstances be confused, which is the one reason why I’m even bringing it up. Making this distinction is vital for your own fashion conscience, believe me. 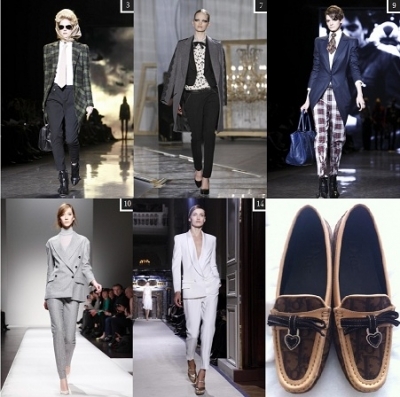 Even if these woman’s autumn 2012 trends indeed have a masculine resemblance, a resemblance is what it will remain. The ‘boyish’ look: Focus on re-shaping the female form through trousers with a more masculine cut, dropping the crotch and keeping ‘British Heritage’ in mind. This will help you nail yet another trend in one and train your eye for the texture/print layering needed to recreate this look. A 3-piece suit look is great inspiration or: a classic shirt will always be the base. Layer with a, preferably, oversize tweed coat. It will pinch you the points in texture and shape, giving you that extra shoulder definition and tie the look together with, well, a tie. The tie saw a hue comeback and has been greatly modelled both on- and off the catwalk recently. The last piece of the puzzle? These gorgeous loafers, of course. I am so thrilled we got them in. Don’t forget that you can comment, rate and share your views on both our Twitter and Facebook Page, xo. A recent story by Jane Mulkerrins for The Daily Mail sparked a lot of interest at the BuyMYheels office and I have no doubt in my mind you can easily see why. It’s a story about Beth Shak, suitably dubbed ‘The Shoe Queen’. Of course, such a title did not just spark interest but also followed by jealousy of her shoe empire but also wonder, at the strong minded woman who has built it all up on her own. We must admit that Beth has gracefully come through obstacles in her life making her truly worthy of the title as Queen – In Chess - the most powerful piece. Beth grew up the youngest of three children and speaks of her mother as ‘her rock’. At the already tough age of 13 Beth’s parents got divorced and only two years later her older sister Lynne, then 18, was killed in a car crash leaving the family struck by grief. Beth said she’s simply lost her best friend and her other was barely functioning herself, as the normally amazing woman she was. ‘It was the first funeral I went to, and it was horrible’ Beth said. ‘I think that event changed the path of my life. I started to make decisions I would not have made had I not been through this tragedy’. Beth went on a quest to seek stability and married at a young age. By 19 she had her first child and by the age of 24 she found herself back at her mother’s arms. She was still so young and a second marriage gave her two more children. As the strong woman she’s proven to be she preferred not to disclose the reason for the personal ending of her marriages as her ex-husbands are fathers of her children and they all now have a strong relationship, which leads us to the story of her relationship with Dan Shak and her life as the fourth Mrs Shak where Beth went from fairly middle-class comfort to sky-rocketing into a life of the super-rich. “‘We had access to three private planes, we had a $7.5 million apartment in New York, a $3 million place here in Philadelphia, a $4 million home in Colorado, and five members of staff,’ she says. ‘My shopping became pretty significant,’ she deadpans. ‘I spent and was allowed to spend whatever I wanted on his black Amex card. And if I was charging things on his credit card, which he saw the bills for, would he know about those purchases or not, do you think?’. ” Jane Mulkerrins wrote. “After 13 year of marriage her third ex-husband Dan famously started legal action against her for 35 per cent of all the shoes she owns – estimated to number around 1,200, including 700 pairs of Christian Louboutins, and to be worth around $1 million (£640,000) – but recently dropped his case”. Beth keeps all her shoes in the house consisting of multiple closets. They are kept under lock and key with entry to the master closet measuring 12ft by 8ft, controlled by a keypad. Dan had claimed she kept her high-end heel collection in a ‘secret room’ and believed her shoes should be considered assets, which she should have been forced to disclose. Never in a million years is the key phrase used in conjunction with a look of horror upon our faces her at BuyMYheels. Just imagine having those gorgeous wonders snatched away from you?. Millions of dollars through hedge funds could clearly not buy you happiness, a lesson Beth seemed to have to learn the hard way as she admits to have done anything not to go back home, drive around or sit in Starbucks for hours. She told Mukerrins of how her children made her come around ‘What sort of example was I showing them? I was showing my sons that this is how you treat a woman, and I was showing my daughter that this is how you should have a man treat you. I couldn’t do that any longer. Leaving was a difficult decision to make, of course,’ she says. ‘All I could think was: “Am I really going to do this again? What’s wrong with me?”’ She misses her life in the city, but not the unhappiness that accompanied it. ‘Maybe I don’t have private planes, and maybe I can’t spend offensive amounts of money on his card every month, and maybe I have to do my own dishes and make my own bed, but I do have inner peace, and there’s no price tag on that,’ she say. Here on BuyMYheels we commend Beth for not just her impressive shoe collection but for her strength that’s brought her to where she is today. This is the introduction of a series here at BuyMYheels where we find the inspiration to help us decide on our future, cross your fingers, shoe collection and the installation of walk-in wardrobes that will host them. Oh, and of course we will also look to ladies who already has it all, from Carrie Bradshaw to Eva Longoria. Yes, even Mariah Carey is of course rumoured to possess a pretty impressive shoe-drobe. But to find out more you have to stay tuned and don’t forget that all your opinions and ideas are more than welcome on our Facebook Page. Summer has finally arrived and so have the sales!